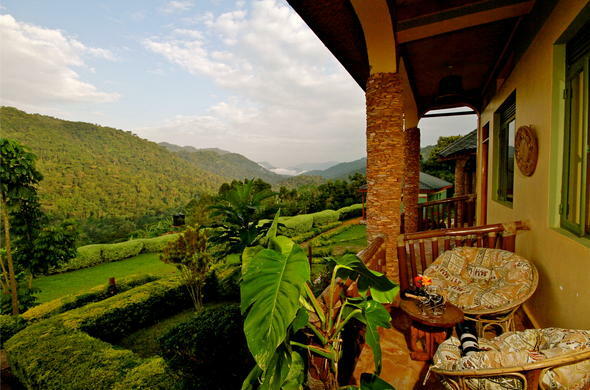 This lodge in Uganda is perched above the valley in the Buhoma Sector of the Bwindi Impenetrable Forest National Park, a UNESCO site. Flights can be arranged from Entebbe Airport or Kajjansi Airstrip (about 25km from the airport) and last for about 1.5 - 2 hours. For small groups or families of 1 - 5 persons, Kayonza airstrip, 25km to Silverback Lodge, is ideal. This would strictly be on private charter basis as scheduled lights do not use this airstrip. Larger groups can use Kihihi or Ishaha airstrips, which are about 60km from Silverback Lodge. Transfers to and from the airstrip can be arranged by the lodge. Mbarara to Kabale is about 140 km. Proceed via Kisoro road and turn right after 26 km following Bwindi National Park signposts. Use the road through to Ruhija and drive 40 km to a T-junction, turn left, then follow signage for Bwindi Impenetrable National Park. Drive 10 km to Silverback Lodge. Mbarara to Katunguru Bridge is about 110km. Drive in the park for about 100km where you will reach a Y-junction, take the left road following signposts to Bwindi Impenetrable National Park. Proceed to Kihihi Y-junction. Here, turn right and drive for about 14km to Kanyantorogo. At the T-junction, turn right and proceed to Butogota. After 2km you will reach a T-junction, turn right and proceed for about 18 km to Silverback Lodge. Location of Silverback Lodge, Bwindi Impenetrable Forest National Park, Uganda.